Mike Mosier, a Marine Corps veteran, completed three tours of service, two in Iraq and one in Afghanistan, before retiring from military service in 2005. He never anticipated his fourth mission or that it would involve a herd of ill-tempered goats. “My relationship with goats is really love-hate,” Mosier said. Mosier said he bounced around between jobs after retiring from the military, never finding a career he felt comfortable in and plagued by symptoms from his PTSD. A couple of years ago, Mosier decided to try his hand at farming and found it suited him. He now owns Fourth Mission Farm in Ashley, IN. The farm currently hosts several agricultural experiments, Mosier said, as he continues to find his stride as a farmer and business owner. He rears chickens and is dabbling in growing produce. Mosier said farm life and work help manage his PTSD. Mosier credits many people and organizations for leading him to farming and said AgrAbility played a major role in this process. AgrAbility is a USDA sponsored program that supports farmers with a range of disabilities across the country. The National AgrAbility Project (NAP) and the Indiana AgrAbility Project (Breaking New Ground) are based at Purdue University. Clients’ disabilities range from arthritis to spinal cord damage to traumatic brain injury. The project offers a wide range of services, including worksite assessments, assistance referrals and case management. 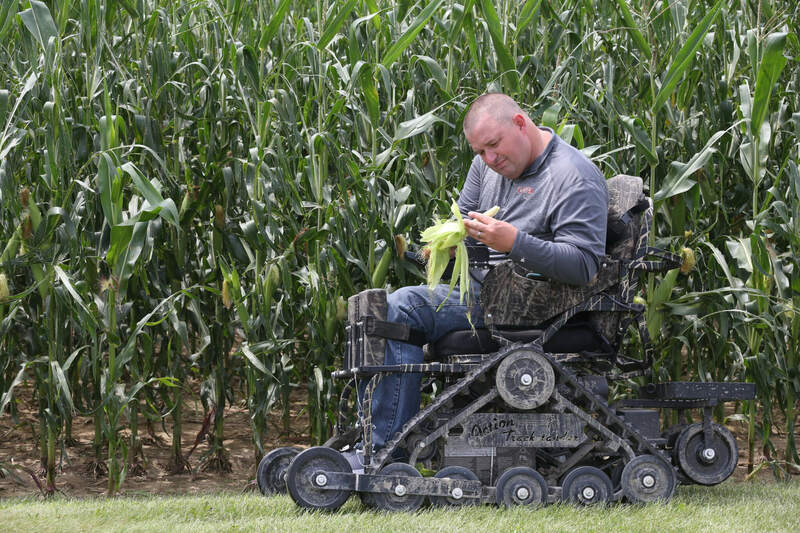 Justin is a disabled farmer who farms over 3,000 acres of ground in Huntington County, with the help of Purdue Extension and AgrAbility. Cindy Chastain, veteran outreach coordinator for AgrAbility, said veterans turning to farming after wartime is a common thread throughout US history. After the Vietnam War and WWII, for example, agricultural careers experienced an influx of veterans. Chuck Baldwin, special populations outreach coordinator for the National AgrAbility Project, said the organization’s 2016-2017 demographics report for the 20 states currently hosting an AgrAbility project showed an increase from the previous year. The number of clients grew by over 250 farmers for a total of 1,553 clients who have received on-site services. Sixty-four percent of AgrAbility’s reporting clients work full-time on a farm or ranch, a much higher percentage than the 12.7% of the general population of persons with disabilities reported by the US Department of Labor in 2017 as working full time. This gives credence to AgrAbility’s effectiveness in enabling a higher quality lifestyle for agricultural workers impacted by disability. Veterans comprise 17.4 percent of all reporting clients across all 20 states. Baldwin added that many of these veterans are pursuing agriculture as a new career path, while others are returning to former careers in agriculture or family farms. Chastain and Baldwin said they think AgrAbility has a hand in turning veterans on to careers in agriculture. Disabled veterans who might once have been excluded from manual labor careers are now able to consider farming as a viable path. Of course, Mosier said farming isn’t a magical salve and it’s challenging work at the best of times, but having a safety net like AgrAbility makes the career possible for him.